$3,500 Invested in Grounding System Upgrade Protects $1.5 Million in Communications, Computers. Resort World, Kissimmee, Florida, is located in a region that receives more lightning strikes per year than any other part of the country. Severe lightning strikes can damage sensitive electronic equipment and disrupt telephone service. Resort World experienced both types of damage until it installed a properly designed, all-copper grounding system. Despite many storms, no further damage has occurred since the new system went on line. No region of North America receives more lightning than Central Florida. With more than 100 days of severe thunderstorms every year, the portion of Florida stretching from roughly Jacksonville to Tampa is justifiably known as the lightning capital of the world. You don"t want to be caught on the golf course swinging your 9-iron when one of those electrical storms comes rumbling by. And, it can be a tough place to operate a business that relies on sensitive electronic equipment. That is, unless you"ve invested in adequate lightning and surge protection and a reliable copper-based grounding system. One of Florida"s leading resort and condominium operators learned that lesson the hard way. The company owns and operates Resort World in Kissimmee ( above image), Crystal Beach & Health Club in Miami and Clarion Suites Lake Buena Vista in Lake Buena Vista, as well as Star Island in Kissimmee and The Harbor Club in Palm Coast. Each year, thousands of Florida vacationers enjoy their luxurious villas, suites and condominiums. These are large resorts, and their state-of- the-art reservations, time-share and computerized business systems must operate smoothly and reliably. In recent years, it has become even more important to ensure uninterruptible telephone service for the resorts" guests, many of whom are elderly. Of what use is 911 if lightning knocks out the phone system? That"s just what happened at the Resort World facility on June 1, 1998. A massive, nearby lightning strike and the resulting power surge took out not just the resort"s phones, but an assortment of computers, communications gear and even appliances. Fortunately, there were no personal emergencies at the time, and no one was hurt, but the telecommunications system and other sensitive electronics were destroyed. Brad Padgett, Resort World"s director of communications, will never forget the incident: "It happened at exactly 1:05 p.m. A lightning strike, typical of Florida thunderstorms, hit very close to the computer and communications offices. One of our technicians saw flames shooting down the wall for an instant. When we pulled out one of our grounding rods later on, it looked like a glass Popsicle; sand had melted to it. "Our communications office was connected to more than 540 lines at the time ( Figure 1a). We thought we were adequately protected by the grounding system that had been installed when the resort was built back in the mid-1980s; after all, it met the national and local electrical codes. However, the resort has been upgraded continuously and our communications systems have grown a lot more sophisticated. I didn"t realize it at the time, but our old grounding and surge protection system just wasn"t able to protect the new equipment we"d installed. "By 1998, we had put in our own telephone switch. The switch cost us something like $160,000, and much of it was destroyed in an instant when the Big One hit. On top of that, the resort lost 60 TV sets, 30 microwave ovens and, of course, phone service to all the suites. In addition to the switch, that lightning strike did about $70,000 in damage. Two weeks later, our Star Island resort next door took another hit. That one did $30,000 worth of damage to their phone switch and destroyed the swimming pool pump motor. "We had to replace a lot of equipment at Resort World. At the same time, we needed to install a larger switch to handle all the phone and data lines being added to the resort, so we upgraded to a CHX 5000 ( Figure 1b). It cost us a half million dollars, and we were really afraid we might lose it if we took another big hit." Figure 1a. Some communications equipment at Resort World. At the time of the 1998 lightning strike, Resort World"s system was connected to 540 lines. (It has since been more than doubled.) Lightning did $70,000 in damage to the equipment, including modems, multiplexers and computers. The facility"s original telephone switch, costing $160,000, was also destroyed. Figure 1b. Resort World"s new Hitachi telephone switch cost more than $500,000. With such expensive electronic equipment at risk from lightning damage, the resort"s insurance carrier insisted that the grounding system be upgraded. The upgrade, designed by Power & Systems Innovations, Orlando, relies on low resistance grounding electrodes, an extensive network of heavy-gage copper grounding conductors and properly grounded transient voltage surge suppressors. If Brad Padgett initially wasn"t convinced he had a grounding problem, his insurance carrier certainly was. "Our insurance carrier took one look at our existing grounding and surge protection systems and told us flatly that they wouldn"t cover us if we didn"t upgrade it," said Padgett. "I had a lot of expensive computers to protect, plus the new communications gear that replaced whatever the lightning had destroyed. Our Multimuxes (multiplexers) got hit the worst. We also lost our modems." Resort World turned to Power & Systems Innovations, Inc. (PSI), a 12-year-old Orlando-based electrical consulting and design company that specializes in lightning protection and related power quality issues. Resort World had called on PSI four years earlier to install a 40-kW emergency power generator. John West, PSI"s founder and president, assessed the site and quickly identified the source of the problem: inadequate grounding and surge protection. "The communications and computer offices were grounded through their four original 10-ft (3-m) galvanized steel grounding rods," he recalls. 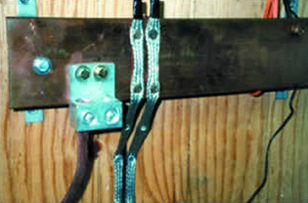 "The rods were connected with #2 AWG copper wire using screw-type connectors, with a single #2 AWG lead to the meter box and from there to an interior panel. The feeder cables were aluminum. Mechanical connections at the ground rods showed some corrosion, which can occur with galvanized rods due to the dissimilar metals present. Surge protection wasn"t adequate considering the expensive equipment they were running. Everything I found had been installed according to Code, of course, but that work was done years before the resort upgraded their electronics. "We measured the ground resistance using a fall-of-potential meter. We sometimes also use a clamp-on meter to cross-check our readings. We drove reference electrodes 300 ft (91 m) from the grounding electrode, as required for accurate readings. We then drove a second set of reference electrodes 300 feet out and 90º from the first set to verify that we weren"t getting any interference. "The ground resistance of the existing system was 105 ohms. A reading as high as that isn"t unusual in this part of Florida even though we have a high water table. The resistance was far too high for the resort"s electronic equipment." The NEC alludes to a maximum resistance of 25 ohms at the grounding electrode. Under §250-54 of the 1999 Code, if resistance is higher than 25 ohms, a second electrode must be driven; however, no further resistance measurements must be made. Therefore, effectively any ground resistance value is acceptable under the Code, no matter how high it may be! Unfortunately, high ground resistance is not suitable for systems containing sensitive electronic equipment. Even if the equipment isn"t damaged by lightning strikes, high ground resistance may lead to data signal errors and other problems. As a result, many grounding technology specialists, as well as installation manuals issued by manufacturers of sensitive electronic equipment, and IEEE Std. 142 (the Green Book) recommend that ground electrode resistance be well below the level permitted under the Code. John West is one of those finicky grounding specialists, and he has published tough specifications for the systems he designs. "Our specs permit a maximum of five ohms at the electrode system no matter how many electrodes are installed for a given structure. For the electrode located at the service entrance, resistance must be measured in the "stand-alone" condition with the system disconnected from the utility neutral. We also insist that the contractor document the fall-of-potential test technique he used along with the type of instrumentation and its most recent date of calibration. We call for a second documented ground resistance test of the entire grounding system after installation has been completed. We sometimes conduct our own tests just to make sure the readings are lower than five ohms. Figure 2. One of numerous grounding electrode conductors installed by PSI at Resort World. The 4/0 conductor at right leads to six 50-ft (15-m), 3/4-in (19-mm) diameter copper-clad rods set in a row running parallel to the rear of the resort"s communications and computer offices, about 12 ft (4 m) from the structure. The conductor leading to the left tags onto one of the building"s original 10-ft (3-m) electrodes. In accordance with PSI specifications, ground resistance of all new electrodes is less than five ohms. "At Resort World, we installed six 50-ft (15-m), 3/4-in (19-mm) diameter copper-clad rods in a row running parallel to the rear of their communications and computer offices, about 12 ft (4 m) from the structure. We had to go down 50 ft (15 m) in order to get below five ohms. One of those electrodes was driven near the emergency generator we"d installed earlier. Next, we connected the electrodes using 4/0 AWG stranded copper cable, exothermally bonding every joint. We also bonded to the fence surrounding the generator and tagged onto the existing electrodes ( Figure 2). When we were through, resistance had dropped to less than four ohms; that"s more than 100 ohms lower than what they had before! "We use exothermic bonding whenever possible, or copper screw-type connectors when we can"t use it. We prefer copper-clad steel electrodes, 3/4-in (15-m) minimum, but we"ll use stainless steel if the soil is corrosive; it depends on what our tests tell us about the local conditions. If we drive more than one electrode, they must be spaced at least as far apart as the length of the deepest electrode. We don"t use any grounding electrode conductor smaller than 4/0 copper. Cable is a small part of the job"s total cost, and copper costs pennies compared with the equipment it protects. "Ordinarily, we like to install a 4/0 copper ring ground (some contractors refer to this as a counterpoise) around the structure and bond everything to it, but that wasn"t possible in this case because of the layout of the resort. "We ran the 4/0 copper into and around the inside of the Resort World"s offices. This arrangement is called a "halo ground." It"s very effective. On this particular job, we ran the cable along the walls, about six feet up. We bonded 4/0 copper from the halo to the neutral-ground connection at the service entrance by way of copper ground plates mounted on the wall and lengths of 29X lightning cable 1 ( Figure 3a). The ground plates were connected with 4/0 copper, and connected to smaller tinned-copper bus strips from there to panels serving the MIS equipment, as well as the equipment itself, using #4 AWG copper ( Figures 3a, 3b). All turns in the grounding cables are generous: our specs call for sweep bends with a 4-in radius, minimum. No sharp, 90º bends are permitted. Figure 3a. Copper ground plate connecting incoming grounding electrode conductors (tinned copper lightning cable) with bare 4/0 copper used as a halo ground. The halo ground is also bonded to other ground plates, as shown in Figure 3b. Figure 3b. 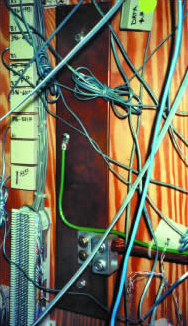 Copper ground plate used to connect 4/0 bare copper halo ground (lower right) with grounding connections (green wire, among others) leading to electrical panels and telephone equipment. The use of ground plates such as this one simplifies the design and installation of the grounding system and ensures that all grounding connections remain at the same potential. Figure 4. IEEE Std. 1100 and other publications strongly recommend that sensitive electronic loads such as those involving computers, communications and control equipment be served by separate branch circuits from those used for conventional electrical loads. At Resort World, PSI placed all such circuits on separate panels, going so far as to mark junction boxes to avoid the chance of mixed loading in the future. "First, we made certain that sensitive electronic loads were served by separate branch circuits (Figure 4). Then we installed a transient voltage surge suppressor (TVSS) at the service entrance panel, two at the UPS transfer switch, and one at each panel serving communications equipment (Figures 5a, b, c). The TVSS units we call for provide full-mode protection: ground-to-neutral, ground-to-phase, phase-to-neutral and phase-to-phase. If you think about it, that"s the only type of suppression that protects the system in the event any conductors are lost. A good TVSS unit will also provide EMI/RFI filtration, but no matter what type it is, it must be properly grounded to a low-resistance grounding circuit. If the TVSS doesn"t see a low-resistance ground, there"s a chance a surge will get past it. "Finally, we replaced the old aluminum feeder cable with copper. Aluminum is permitted under the Florida Code, but I never install anything but copper." Figure 5. Various transient voltage surge protectors (TVSS) installed at Resort World: (a) on the transfer switch connecting to the UPS; (b) on the service entrance panel; (c) on a panel serving communications equipment. TVSS units are inexpensive insurance against equipment damage due to line voltage surges, but they must be of high quality, providing full-mode protection, and they absolutely must be properly connected to a low-resistance ground in order to function. 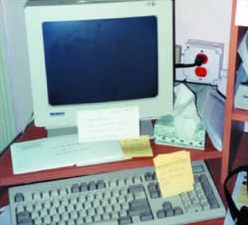 At the time of the original upgrade, the new grounding system wasnt bonded to the panels or equipment in the computer room because Brad Padgett didnt think the equipment needed it. (He was shortly to learn otherwise.) However, PSI did install a halo ground and a ground plate in the computer room, leaving them dead-ended. Did all that protection work? Ask Brad Padgett today: Weve had many lightning storms since PSI upgraded our system. I was resetting a port with my arm inside the new switch cabinet when one of them hit. I heard the crack and saw a spark jump from one of my electrical panels to the copper ground plate that John West had mounted on a wall. You could smell ozone from the discharge, but I never felt a thing and not one piece of equipment was damaged in any way. That convinced me my equipment needed better grounding, too! The charge that almost got me apparently came in on the sheath surrounding the incoming telephone cable. The sheath was grounded to my equipment panel, but the panel wasnt connected to the new grounding system. The lightning sought out the lowest resistance path to ground, and that was, of course, the new ground plate. If that copper plate hadnt been there, we might have lost the new switch. And me. Figure 6. The Star Island Resort, located adjacent to Resort World in Kissimmee, Florida, also suffered costly lightning, and power quality-related damage, including destroyed communications gear and burned-out swimming pool motors. There has been no further damage at the resort since PSI installed a low-resistance copper grounding system. "In fact, we haven't lost or suffered damage to a single piece of equipment since we installed the new grounding system," Padgett says. "That's also true at Star Island, where PSI upgraded the grounding system at their communications offices, one of their clubhouses, the guard shack and the reception center ( Figure 6). We used to lose computers and telecommunications equipment at Star Island regularly due to brownouts and surges, and we replaced swimming pool pump motors costing $500 apiece two or three times. We don't have to do that anymore." And for good reason: all vulnerable equipment is now positively grounded. Because a lagoon separates several buildings, PSI couldnt install a ring ground. The problem was overcome by simply running 4/0 grounding cable through the lagoon. The body of water helps ensure low ground resistance. Brad Padgett is a believer now. After we learned how important good grounding is, says Padgett, we had PSI install grounding and surge protection at Lake Buena Vista, Crystal Beach and The Harbor Club. All of those facilities used to lose computers and other electronics regularly, but they havent lost a thing since PSI upgraded their systems. Figure 7. A typical workstation in the construction office that technicians at Resort World call Hell House for its many power qualityrelated problems. The problems are a thing of the past, since PSI installed grounding electrodes having less than 4 ohms ground resistance, plus TVSS protection and dedicated circuits for sensitive electronic equipment. In addition, PSI specified isolated grounds for the sensitive circuits, as can be seen by the orange-colored outlet shown in the photo. Finally, PSI specified that branch circuits serving sensitive electronic equipment must contain no more than two outlets each. Among other benefits, limiting the number of outlets per circuit reduces the magnitude of harmonic currents on neutral conductors. Padgett continued, "We also have a construction office that serves both Resort World and Star Island. We fixed or replaced equipment there so often we started calling the place 'Hell House.' It houses computers for about 25 workers, a laser printer and the usual office equipment ( Figure 7)." John West recalls the structure. The building sits near a stream and right next to a wetlands area. Before we were called in, the building had a shallow grounding electrode near the service entrance, but despite the wet ground, resistance was higher than 100 ohms. We drove a deep electrode at the service entrance and one more 30-ft (9-m) electrode right at the edge of the wetlands. Ground resistance dropped to less than four ohms. We also installed full-mode TVSS protection at the buildings main and branch circuit panels and pulled isolated grounds (IG) for each circuit serving computers, faxes and printers. We specified a maximum of two outlets per circuit. Some people might consider that excessive protection, but the building now has excellent power quality and the owners havent had any further equipment problems. The NEC permits up to 13 outlets on a 120V/20A branch circuit. IEEE Std. 1100 (the Emerald Book) recommends that branch circuits for sensitive electronic equipment be separated from those serving lighting and other loads and that any dedicated circuit contain no more than four outlets. Proper grounding doesnt have to be expensive. A quick check of the invoice file revealed that the installation of the low-resistance grounding system at Resort World cost about $3,500, including the 4/0 copper cable. Brad Padgett thinks that was a bargain. Were protecting more than $1.5 million of equipment for a few thousand. Thats cheap insurance! And then theres the safety factor. We dont have to worry that our phones wont work when theres a storm. If one of our guests needs help or has to make an emergency phone call, the phones will work. As for myself, whenever I hear thunder, I want to be inside my computer room. I look at all that copper surrounding me and believe Im in the safest place in town! 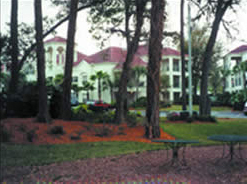 Clarion Suites Resort World and neighboring Star Island Resort & Club, Orlando, are two of five facilities owned and operated by one of Floridas leading resort and condominium organizations. The resorts offer villas, condominiums and suites for vacationers and retirees, along with a full complement of recreational, sports and fitness facilities. Brad Padgett is director of communications for Clarion Resort World. Brad has personally experienced the hazard of living within Florida"s Lightning Alley and has come to appreciate the value of a properly designed and installed copper grounding system. For additional information about power quality issues, visit our Power Quality section. The term 29X lightning cable refers to a braided cable having a cross-sectional area equivalent to 29 strands of #16 AWG wire.